I read this article and found it very interesting, thought it might be something for you. The article is called Campaign Manager’s update: tax dodgers, upcoming events, and more and is located at https://votesocialism.com/campaign-managers-update-tax-dodgers-upcoming-events-and-more/. If you’re following the news, you probably got as ticked-off as all of us in campaign headquarters. Why? Amazon’s bullying CEO Jeff Bezos attempted to bludgeon to death the progressive–but still too small–tax on big business under consideration by the Seattle City Council. Called the “head tax,” it would charge the largest companies in Seattle a small amount per year, per employee. The proposal before the council would raise a modest $75 million a year to put towards solving the homeless and housing crisis in the city. Having protested the constant stream of regressive taxes on workers and the poor for decades, the campaign supports the head tax, and other progressive taxes on wealth. Read on for the latest updates from our activist campaign. 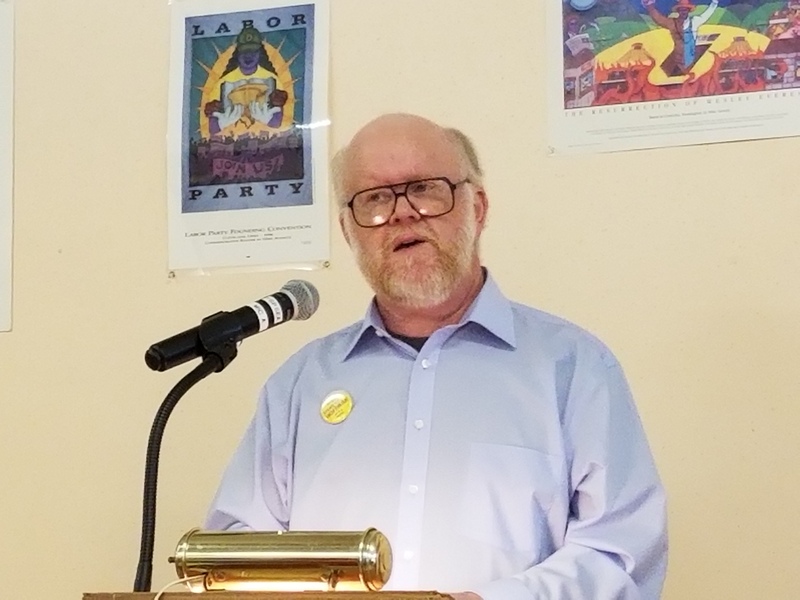 Steve spoke at Freedom Socialist Party and Radical Women’s May Day Celebration, sharing an insightful analysis of such profound problems as global warming, expanding income inequality, and endless wars inherent to the capitalist system. He explained how through socialism these problems could be addressed. In addition, lively conversations over an excellent brunch fueled both the mind and the body. Assistant Campaign Manager Jared Houston spoke in favor of the head tax at Seattle City Council hearing Wednesday morning, noting that while the Hoffman campaign slogan is strength through solidarity, big business’ slogan is “division through hysteria.” You can listen to Jared’s statement here. Seattle Radical Woman Adrienne Weller spoke at the hearing too – watch here. “Trump’s Trigger Happy War Cabinet Versus Socialist Internationalism” is the title of a recent position statement put out by the campaign. It recognizes that the two new appointees by Trump, Mike Pompeo as Secretary Of State and John Bolton as National Security Advisor, signal a much more open hawkish administration. However, this position paper reminds us that both the Democrats and Republicans vote year after year for war funding and military appropriations. Saturday, March 12, Steve and Advocates for Hoffman volunteers are joining the March on Amazon! Tax Big Biz to Build Affordable Housing! Meetup at Seattle Central College at 11:00 am. See you there? On Tuesday, March 15, Steve is speaking to the Retired Public Employees Council (RPEC) meeting. A week later, Organized Workers for Labor Solidarity (OWLS) is sponsoring a picket opposing the anti-union plaintiff Mark Janus, whose lawsuit is headed to the Supreme Court. Steve plans to go raise his pro-labor voice here on Tuesday, May 22, 8:30 am at the Hyatt Regency Bellevue. Details here. Bright new brochures with expanded content are a welcome addition to the postcards and half-sheets making up the main pieces of campaign literature. All are available for distribution and we’re glad to mail them to you if you contact the office. Coming soon are yard signs, car window signs and position papers. And we always need help making buttons. Volunteer Nights continue every Wednesday evening at 6:00 pm. Come to campaign headquarters, 5018 Rainier Ave. S., in Seattle’s Columbia City neighborhood to help with a variety of campaign activities. Contributions totaled over $2,900 following Steve’s talk, “How to Build Working-Class Power,” at the May 6th May Day Celebration! Thanks to everyone able to donate. Many of you can expect a just-mailed fundraising appeal to land in your U.S. mailbox. Please donate what you can. And for those of you not on the mailing list, you can still contribute by sending a check to Advocates for Hoffman, 5018 Rainier Ave. S., Seattle, WA 98118. If the amount you send us is over $200 during the life of the campaign, please include your name, mailing address, occupation and the name of your employer to satisfy federal law. Easy to do online at our donate page. Signing off from the Hoffman Highway for this week!